Vlčí Hora is a small village located at the foot of a hill with the same name, in the north-west direction from Krasna Lipa. The village’s origin dates back to the year 1589 and the name is probably derived from the abundance of wolves present at that time. There is a newly restored church of St. Mary, Our Lady of Mount Carmel, from the year 1870 in the village. By the church stands a memorial to 36 local people fallen in WWI. In the directions west and south from the village lies the geological line of the Lusatian transposition, where blocks of sandstone and granite from Brtníky meet. 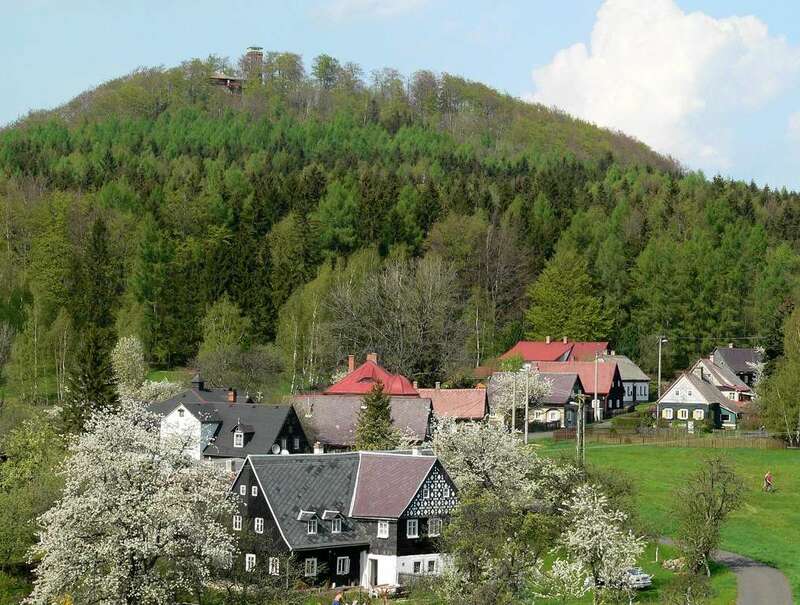 The border between the Lusatian Mountains and the Labské pískovce (Elbe Sandstones) nature conservation areas runs through the village. Beyond the western border of the municipality is Bohemian Switzerland National Park. Vlčí Hora is the administrative part of Krásná Lípa, and due to its character and attractive surroundings, it is a recreational centre and fashionable for cottagers.